The conversation took place during the 2016 Green Academy and is a part of the series of interviews conducted by Bartul Čović. Zoltán Pogátsa is a political economist and lecturer at the West Hungarian University. At the Academy he participated in Tuesday’s evening debate “Europe, Its Economic Failures and Hopes”. BARTUL ČOVIĆ: What is the perspective of cooperation between the Left and the Greens? Should we identify capitalism as one of the main driving forces behind the ecological catastrophe of our planet? ZOLTÁN POGÁTSA: Capitalism as such, broadly speaking, cannot be blamed for climate change. I think that capitalism has undergone numerous stages as it has developed, both in time and geographically. I think that there are different phases of capitalism all the time. Some phases have been worse, others better. There have also been varieties of capitalism in terms of regions, some worse, some better. I can imagine forms of capitalism that are sustainable. Obviously the dominant form of capitalism that we have today is a neoliberal form, which is not sustainable and is largely to be blamed for the environmental catastrophe that the world is actually experiencing, no longer just heading towards. So, I would be more specific, I would say it is this kind of neoliberal capitalism that can also be translated as sort of upper class capitalism. “Neoliberal” is too nice a word, it sounds too light in some sense, it is actually class war of the upper classes who are driving resources towards them, profits towards them, and an ever larger share of the value added as profit towards them, and that is what is causing the devastation. Both socially and environmentally. In the evening lecture you posed a question from the audience. You had some problems with the definition of neoliberalism that was posed by one of the speakers. What is the most common mistake people make when they define it? The speaker said that you cannot say that post-communist Eastern Europe has had neoliberalism, because in his view neoliberalism advocates competitive markets, and in post-communist Eastern Europe we have never had competitive markets, therefore have not had neoliberalism. This I think is a very common mistake, because people take ideology at face value. You don’t take ideologies at face value. Communism used to say “we are creating a just system of peoples’ democracies…” and that was not what was happening. There is a difference between what ideologies say, and what they actually do. In case of neoliberals they claim that they are out to create competitive markets, but in reality neoliberalism has been in power since 1979, and in some places 1974, like in Chile, or the 1980s in the US and the UK. They have had decades and decades. If they genuinely wanted to create competitive markets, they could have created these competitive markets by now. But we see exactly the opposite. We see this kind of monopoly capitalism where markets are run by fewer and fewer larger and larger corporations. Its oligarchs are getting so close to the state that it is a captured state type situation that has arisen. It is much more like oligarchs and business elites capturing the state and cornering markets, rather then competition, which neoliberalism has created. So let us not accept ideology at face value. If you take this more streetwise definition of neoliberalism that claims to be creating competitive markets but in the end they actually create cornered markets and captured states, I think this perfectly describes what has been happening in Eastern Europe after the fall of communism. The rhetoric of this ideology was that now we would go from the omnipotent state to an omnipotent competitive market, but in reality nowhere in the region do we see anything close to competitive markets, what we see is the massive robbing of the state by clients of political parties, and often business elites capturing the states and cornering the markets and that perfectly describes what neoliberal capitalism is and fits very well into what was generally happening in the last decades. Lets go to the present European context. We had massive articulations of people’s dissatisfaction with the EU with “OXI” and Brexit. How optimistic or pessimistic are you in the context of the EU’s collapse and the growth of dissatisfaction with its politics? Which ideological form will this dissatisfaction take? Will the extreme Right or the radical Left capitalise upon this? This is a very interesting question because there are some ways in which Grexit and Brexit are similar, and there are some ways in which they are very different. The way they are similar is that I think in some sense both have come about as reactions to neoliberal globalisation. The rise of Syriza was about the Left giving it a try. This is very rare because most mainstream Left wing parties across Europe had become neoliberal. The Party of European Socialists is actually, generally speaking, a neoliberal umbrella organisation. In some cases they are almost identical with the Right. For example, you cannot tell the difference between SPD and CDU in Germany. When I mention the name of Sigmar Gabriel, nobody knows who on earth he is. The Greek, Dutch and French Socialists have completely collapsed. Think about the Left before. Figures like Willy Brandt. These petty politicians today are hardly separable from the Right. So Syriza, which was actually created because PASOK was collapsing, came about as one possible alternative, given that the mainstream Left had been unable to reform itself. Another wave of the real Left, Syriza, was a revolt against austerity, against the neoliberal regulations of the Eurozone. The mainstream Brussels/Berlin story had portrayed the crisis of the Eurozone as a sovereign debt crisis: too much overspending by member states. This is a largely false narrative. Greece had already had a very high debt level back in 1993, effectively a sovereign debt crisis. Then this debt level stayed pretty much at the same level during the Eurozone years. Other member states, such as Spain, Ireland or Finland did not even have high debt levels when the crisis emerged. So this is not why Eurozone went into crisis. The reason why Eurozone went into crisis is because of the nature of neoliberal capitalism. It has to do with bailing out the banks, it has to with withdrawing resources from investments into human capital, it has to do with oligarchic state capture and the poorly constructed nature of the Eurozone. The Berlin narrative, which had been widespread across Europe, had claimed that sovereign overspending was the key cause. This was challenged by Syriza in 2015. When they mounted the challenge and won the referendum the EU acted against them by the European Central Bank (ECB) drying out liquidity from the Greek commercial banking system. This is not just me saying it, the three leading, highly regarded experts on the Eurozone, professors from whose textbooks students learn about Eurozone, Paul de Grauwe, Charles Wyplosz and Barry Eichengreen, all three of them published public articles in which they separately but clearly state that the ECB was misusing its mandate to dry out liquidity in the Greek banking system. It was basically blackmail. They were trying to force a democratically elected real Left, mild social democratic government to either accept further austerity, or collapse. Varoufakis would have resisted, but Tsipras eventually gave in. Syriza has since stopped being an alternative and has become another neoliberal fake Left wing party, enforcing austerity. The EU institutions basically castrated a Left wing attempt at creating an alternative. Now what connects this to Brexit is that Brexit is also a revolt against the neoliberal globalised form of European integration, but it is a Right wing attempt, based on ethnicity, by people who are losers of neoliberal globalisation. It might be true that labour migration from Eastern Europe has been benefiting the British economy as a whole, but this is certainly not true at the local level or at the level of the individual. There is a Bank of England study which actually demonstrates that Eastern European migrants have actually driven down the wages of low wage workers. If you are a bus driver in Liverpool and there is a Polish guy driving a bus, and you don’t have a job, and the jobs that are available are now paid less because of incoming Lithuanians and Poles, you do not give a damn about benefits to the British economy overall. These people were captured by the Right because of the absence of the Left. Every time the Left gets castrated, like Syriza, the Right gets stronger. As Walter Benjamin said: “behind the success of the Right there is always the failure of the Left.” That is exactly what happened in Europe. If you do not allow people like Tsipras or Varoufakis to represent dissatisfaction, it will be people like Farage, Trump or Orban who will capture the losers, perceived or real, of neoliberal integration. This is what connects Grexit and Brexit, and the difference is that one was driven by the Left, the other by the Right. Each time you prevent an attempt by the Left, this happens. Francois Hollande promised very high tax on high income in France, but instead he introduced labour market flexibilization. The result was the rise of Marine Le Pen. Syriza grew out of the social movements and had support of it in the first month of government. Social movements mobilised during the OXI campaign etc. It was a bottom up initiative. But there are always tensions between the base and the part of the movement that goes into representative politics. Now Yanis Varoufakis is heading Diem25. A lot of critiques from the Left are claiming he is naive and that he will not be able to change anything from the theatre in Berlin given that he did not change anything with governmental power in his hands. 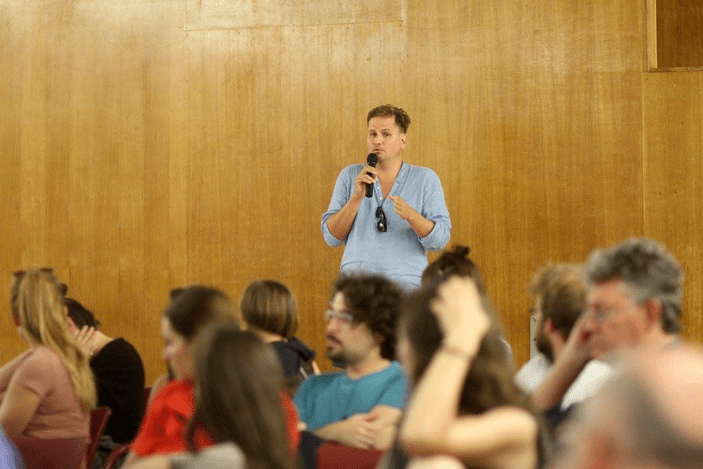 Can the Left win the battles in the future through parliamentarian organising, or do we need a stronger extra-parliamentary movement? Well I was in that theatre in Berlin with Varoufakis when we launched Diem, so I think I have some understanding of what is he trying to do here. I do not see the problem so much as being the alienation of the leadership of the movement from the ordinary members. I see the problem as what Gramsci describes as homogenous discourse which means that formally there are elections, competing parties, you can choose whoever you like, you can choose Syriza, Podemos, United Left etc. All these alternatives are formally available, so liberals and conservatives can say “there is a democratic policy, you have a choice, what are you complaining about?”. The problem is that it goes much deeper than that. Once you get elected, or even before, there are many other elements of the functioning of the formal democracy. The old saying that you can choose your leaders but you cannot choose your policy is good one here. You can have anybody in power, popular people like Jeremy Corbyn, Bernie Sanders, but there is this much deeper structure there which guarantees you do not implement anything that the neoliberal deep structure does not like. Entities like the media dominantly owned by oligarchs are a good example. In the US there was a study that suggested that during the 2016 presidential elections the US media spent more time broadcasting the empty stage waiting for Donald trump than the entire airtime they devoted to covering speeches by Bernie Sanders. Predominantly business owned media is one obstacle. As we saw with Syriza, regulations at European level are another obstacle. The intransparency of European decision making is yet another one. You cannot solve these problems in one country, say Greece. This is bigger than Greece or any other country. We must try to bring all progressive people together. Zoltán Pogátsa is a political economist researching issues related to European Integration. He is head of the MA Programme on Economy and Economics at the West Hungarian University, and also teaches at ELTE, the Central European University and at the University of Verona. He has published 7 books, numerous articles, and is a regular commentator on European economic issues in the Hungarian and international press.